Those lucky enough to have an April birthday get to enjoy the most prized gemstone of all, the diamond. It makes the perfect birthstone gift as it’s not just for engagement rings. Diamonds add just the right sparkle for everyday wear, special occasions and everything in between. Diamonds have several traits that make them stand out from every other gemstone, including their property of strength. Named for the Greek word “adamas” meaning hard or indestructible, diamonds are the hardest gems (10 on the Mohs scale of hardness), though they can chip or fracture along their cleavage lines. Made only of carbon, diamond is actually 58 times harder than anything found in nature and can only be cut by another diamond. This property of strength translates into a symbol of emotional toughness and resilience. You can find the beautiful sparkle of a diamond in several colors including yellow, red, pink, blue and green. If you are in the market for a colored stone, remember that typically the more saturated the color the higher the value. More and more people are opting for these unique colors to give their jewelry a personalized touch. 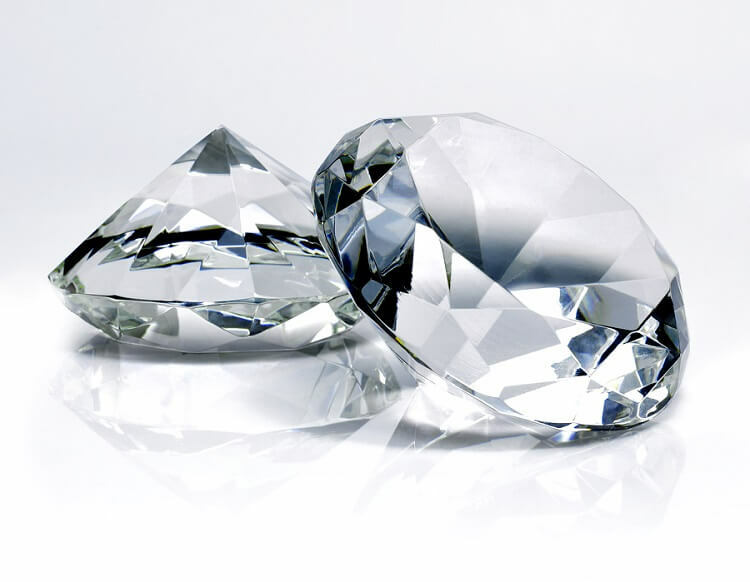 Some experts estimate that diamonds were traded as early as 4 B.C. They gained popularity because of the process they go through to be formed well below the earth’s crust. The Moghuls and Imperial Colony mined them easily along the three main rivers in India, and diamonds were traded among royalty and the wealthy. Ancient civilizations believed that diamonds were lightning that had been captured and made real on earth. Because of this, these ancients thought that a diamond’s power could be bestowed on the wearer. Diamonds have been associated with great healing powers and even courage. After this large supply in India began to dwindle in the 1700s, Brazil became an important source of diamond mining. Later, they were discovered in South Africa in the 1860s, marking the beginning of the modern diamond market. Since these early beginnings, diamonds have adorned both women and men and came to be regarded as the ultimate gift and symbol of eternal love. The incredible shine and luster of a diamond has captivated wearers for centuries and adds light and beauty to any occasion. When you are ready to make your purchase – whether a mined or lab-created diamond – take time to understand the 4Cs: cut, color, clarity and carat. Also ask your jeweler how it performs (or sparkles) in a range of lighting conditions. A well-cut diamond will shine in any light. There is a diamond for every budget and the one you choose will sparkle with an internal fire all its own. When you are ready to insure your precious stone, contact Lavalier for a personalized jewelry insurance quote. Birthstones. www.AmericanGemSociety.com. (accessed March 5 2019). April Birthstone. www.gia.edu. (accessed March 5 2019). Birthstones. www.brilliantearth.com. (accessed March 5 2019).